The Short Version. In the early 1800s, my grand-mother’s families were ethnic Germans living in Prussia, in what is now Poland but what was, at the time, then part of the German Empire. Both of my great-grandparents emigrated to the US in the mid-1800s where they met in Wisconsin and were married. My great-grandfather was Wilhelm Boldewahn. His full name was Albert Rheinhold William Boldewahn but he preferred William. 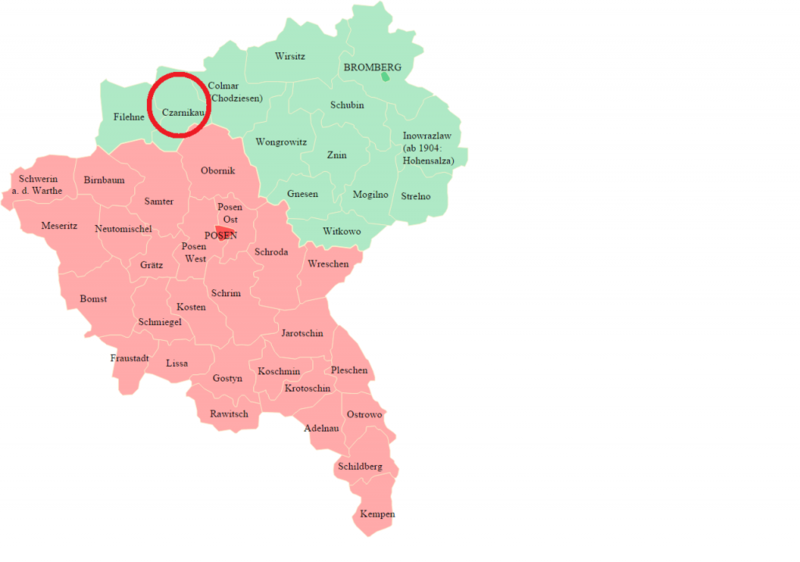 His family came from the village of Gruenwald in the northern part of Kreis Neustettin (County Neustettin). 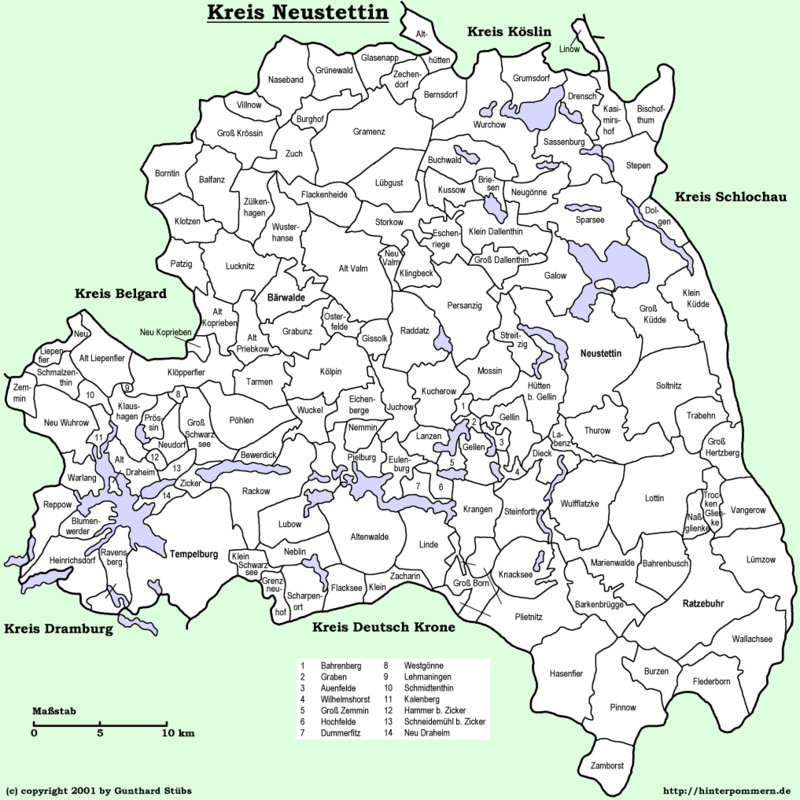 Kreis Neustettin was located in the northern part of Pommern, Prussia. Wilhelm was born on May 30, 1851 to Johann Boldewahn and Charlotte Freiberg. He had two siblings: Wilhelmine “Minnie” Fredericke Auguste (born 1845) and Henriette Louise (born 1847). Minnie married Martin Adam Pommerening on July 31, 1863 in a church in Gramenz, Kreis Neustettin and stayed in Prussia. Sister Henriette emigrated to Oshkosh, Wisconsin in 1870 and married Johann Schabloski on August 27, 1870. Wilhelm emigrated to Wisconsin via the port of Bremen, arriving in Baltimore on April 1876 on the ship SS Braunschweig. After living in Oshkosh and working in a saw mill, he married my great-grandmother on July 17, 1880. In 1905 they established a farm in Vinland. The farm was sold in 1929 and the family returned to Oshkosh. They had three children: Otto, Meta and Erna. William died on May 30, 1937 and a picture of his grave in Riverside Cemetery can be found here. Uta Härtling has written a detailed and comprehensive “History of Gruenwald”. You can download a copy of the PDF file here. My great-grandmother was Ernestine Wilhelmine Dragorius. The name has many different spellings over the years: Dragerius, Dragurius, Dregonis, Dragorus, Drigolias, Tragorius and even Gregorius. 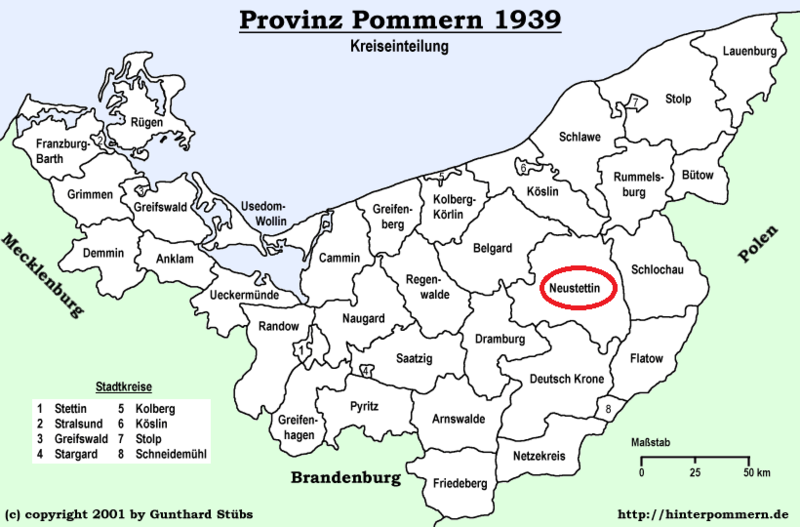 Ernestine’s family settled in the western part called Posen inside the “county” or Kreis Czarnikau. 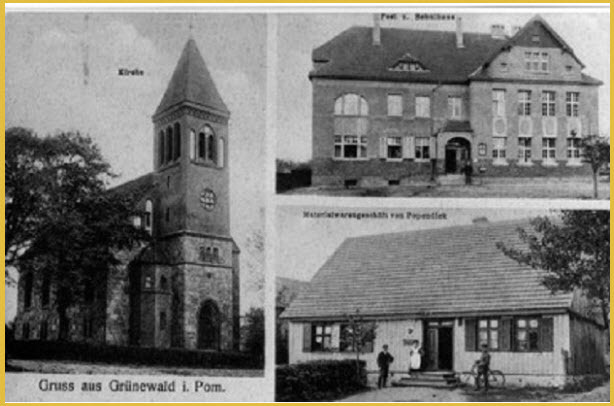 Ernestine was born on September 16, 1859 in Romanshof, a small town situated near the cliffs overlooking the Netze river. 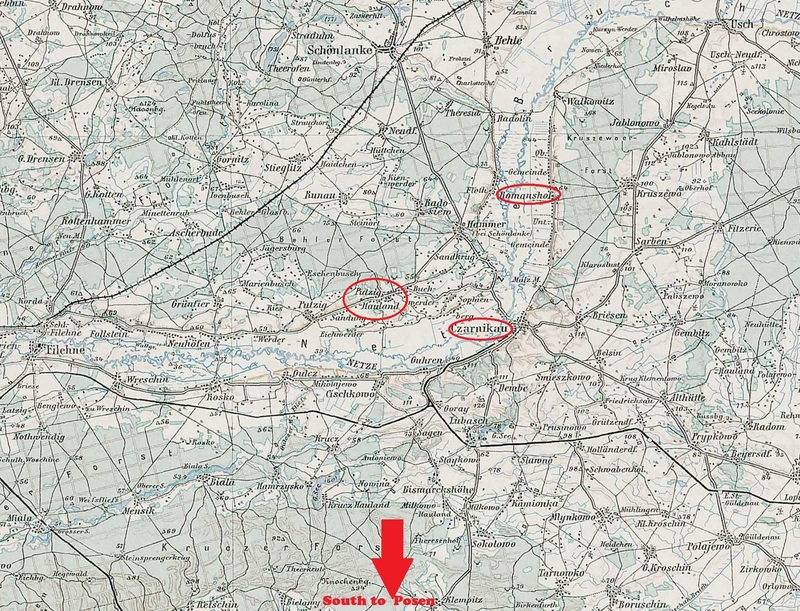 To see a map of the area from the early 1900s go here. It is unclear when my great-grandmother emigrated to the US, but it was at a relatively young age. In the 1900 US Census, Ernestine gives her emigration date as 1865. On her marriage certificate, she lists her father as Frederick Dragorius and her mother as Caroline Koenig. An Ernestine Dragorius, age 6 arrived in 1865 on the ship Othello from Hamburg to Quebec City with her parents Frederick and Louise Dragorius. On the shipping form, their residence was listed as Putzig Hauland, Preußen (Germany). Putzig Hauland is located along the river Netze in Posen, a few miles south of Romanshof. This would make her birth date 1859 which approximates Ernestine Boldewahn’s birth dates as reported in the 1920 US Census. In a newspaper article about her 50th wedding anniversary, Ernestine said her family emigrated to the US when she was 1 year old – this would place their emigration date in 1860, not 1865. In her obituary, she was said to have emigrated when she was 3 years old, which would place their emigration date in 1862. After emigrating to Wisconsin, Ernestine‘s father worked in a saw mill. He died in 1882 when she was 23 years old. Her mother passed away in 1881. Both were buried in Riverside Cemetery in Oshkosh, Wisconsin in unmarked graves. Ernestine died on Jan 28, 1935 at the age of 75. She too was buried in Riverside Cemetery in Oshkosh, Wisconsin. A picture of her grave can be found here. 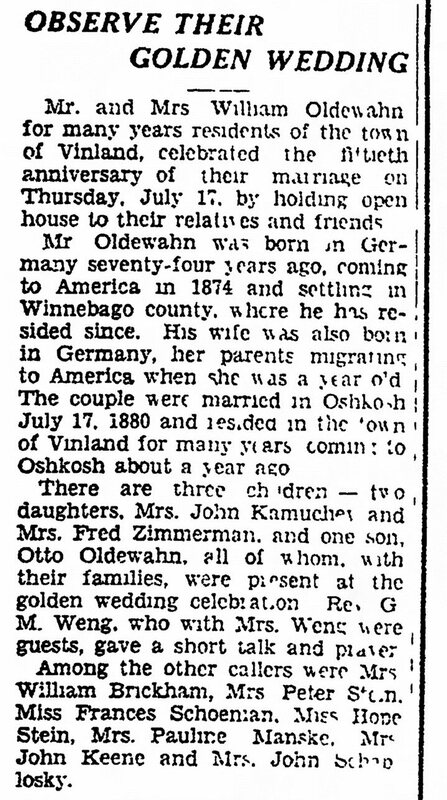 My grand-mother, Erna Boldewahn married my grandfather, John Kamuchey on March 8, 1926 in Oshkosh, Wisconsin. Erna and John eventually moved to Milwaukee, Wisconsin and had 9 children. Info about Erna’s family is found in the Kamuchey section. Life in Prussia in the 1800s. In the late 1700s and early 1800s many ethnic Germans emigrated to East Prussia. While Germans had always settled in the areas now owned by Poland, after the Protestant Reformation of the 1500s, many Protestant Germans were forced to leave Poland’s primarily Catholic holdings. This left the Polish nobility with fewer skilled workers to develop their lands so they they slowly started to invite Germans back to work for them. Leaflets were sent out to Germany, promising free travel, financial assistance in setting up their farms, and religious freedom. These new settlers settled into “colonies” with German names. The colonies would negotiate the rights to the land from the Polish nobles and were able to set up their own schools, churches and laws. Unfortunately, the area suffered from significant political unrest with numerous military actions. At one point in time the area was held by Germany, Poland, France, Russian and even Sweden. During this time many of the legal rights negotiated by the German settlers fell by the wayside and in some areas Protestant churches were destroyed. However, all that changed in the late 1700s when the area was partitioned and divided between Germany, Russia and Austria. But whether Polish or German, the constant warfare had its impact. Rising tax rates meant that land became prohibitively expensive to buy. Waves of disease and crop failures swept across the area. In 1842, a cholera epidemic killed almost half of the population of the city of Czarnikau. Potato blight in 1845 caused widespread famine. This was followed by disastrous weather conditions in the mid 1850’s. Steep declines in grain prices in the years 1880-1886, caused by imports of cheap cereals from America and Russia, and an accompanying drop in wool prices severely reduced farm revenue. It is no wonder then that mass numbers of Germans left Prussia to move to the United States where land was cheap and plentiful. Between 1852 and 1855, the Wisconsin Commission of Emigration actively encouraged the settlement of European immigrants in Wisconsin. Pamphlets extolling the state’s virtues were published in German, Norwegian, Dutch, and English and were distributed throughout Europe as well as in eastern port cities. Advertisements were placed in more than nine hundred newspapers. By 1855, however, the rise of antiforeign sentiment, or nativism, led to the dissolution of the commission. “When [linguists] set out to study the area’s census, church and court records, [they] had no idea the language had thrived for so long. The year 1910 was already a full generation after the mass migration had dropped off, yet Salmons discovered not only that many in Hustisford and other farm towns were still bilingual, but that a sizeable portion was monolingual.